While technological improvements and stricter safety regulations have reduced coal mining related deaths, accidents are still too common. China, which produces more than one-third of annual global coal output, accounts for more than two-thirds of mining deaths around the world each year. Mining-Technology profiles major coal mine disasters around the world. Most of the coal mine disasters around the world were caused by gas and coal dust explosions. Image Courtesy of Truthout.org. Coal mining accounts for most of the fatal mining disasters. Image Courtesy of Coal: timquijano. The coal mining industry in China is responsible for most of the recent mining disasters. Image Courtesy of Herry Lawford. The Courrieres mine disaster on 10 March 1906 in France killed 1,099 people. Image Courtesy of Soerfm. UK's Senghenydd Colliery disaster in 1913 killed 439 coal miners. Image Courtesy of Seth Whales. The 1866 Oaks coal mine disaster in the United Kingdom killed 388 people. Image Courtesy of Victuallers. Monongah Coal Mine Disaster in 1907 is the largest mining disaster in the US that took 362 lives. Image Courtesy of ShutterSparks. The Benxihu colliery disaster in China cost 1,549 lives and is believed to be the worst coal mining disaster ever. The tragedy occurred on 26 April 1942 in the Honkeiko coal mine, located near Benxi in the Liaoning province of China. The ventilation system was shut off and the pit head was sealed by the mine operator to deprive the underground of oxygen. An electric fence was erected around the pit to obstruct the entry of miner’s relatives. The coal mine was forcefully operated by the Japanese until the end of World War II in 1945. The Soviet Union conducted an investigation of the mine accident, following the liberation of Liaoning province from the Japanese Army’s control. Carbon monoxide poisoning due to the closure of the ventilation system was reported to have caused most of the deaths. The Courrieres mine disaster in France, with a total death toll of 1,099, is the second deadliest coal mining disaster in history. The coal mining catastrophe occurred on 10 March 1906 due to a massive explosion sparked by an underground fire in one of the pits of the Courrieres Colliery. 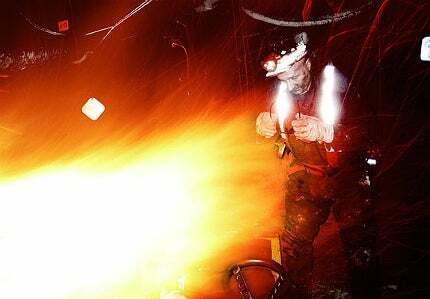 The fire was detected around 270m underground in the Cecil pit in afternoon the day before the explosion. The outlets of the pit were closed to starve the fire of oxygen. The next morning a huge explosion emanated from the still-smouldering fire at the pit and caused a blast on the surface. Workers inside the mine’s deep tunnels, as well as people on the surface, were killed in the disaster. The fissures in the pit’s walls were believed to have allowed the flammable gases to cause a coal dust explosion underground. The cause of the initial fire was suspected to be either because of the mishandling of mining explosives or due to the ignition of methane by the flame from a miner’s lamp. Mitsubishi Hojyo coal mine disaster, the deadliest mining accident in Japan, caused 687 deaths. It was caused by a gas explosion at the Mitsubishi Hojyo coal mine located in the Kyushu Island of Japan. The disaster took place on 15 December 1914. The gas explosion, which occurred underground, caused thick black smoke to come gushing out of the air vents before it finally blew the elevator cage 15m up into the air with a massive blast. People within a 200m radius of the mine entrance were also impacted by the explosion. Laobaidong coal mine disaster, the second deadliest in China after the Benxihu colliery disaster, killed 684 people. The disaster occurred on 9 May 1960 in the Laobaidong coal mine, located near Datong in the Shanxi province of China. The accident was caused by methane explosion. The information about the Laobaidong catastrophe was suppressed by the Chinese Government for more than three decades until it was revealed in 1992. Laobaidong disaster is the most fatal coal mine disaster since the inception of People’s Republic of China (PRC) in 1949. It was a coal dust explosion around 500m below the mine’s ground level entrance. The explosion led to a massive blast which collapsed the tunnel roof at multiple locations. Most of the deaths were due to carbon monoxide poisoning. Most of the poisoned survivors suffered severe brain damage. Miike was one of the oldest and largest coal mines in Japan. It was taken over by Mitsui in 1899. The coal mine ceased its operations in 1997. The Senghenydd Colliery disaster is the worst ever mining tragedy in the United Kingdom. The disaster, also known as the Senghenydd Explosion, occurred at the Universal Colliery in Senghenydd near Caerphilly, Glamorgan, Wales, on 14 October 1913. The fatal disaster was a result of a coal dust explosion in the underground mine. 439 miners were killed in the accident. Most of the miners who survived the fire and explosion were killed due to carbon monoxide poisoning. Firedamp ignition, caused by electric sparking possibly from equipment such as electric bell signalling gear, was suspected to have started the explosion. The initial fire ignited the coal dust present on the floor and the explosion travelled through most of the underground workings. Coalbrook mine disaster with 435 deaths is the worst ever disaster in South Africa’s mining history. The disaster took place on 21 January 1960 at the Coalbrook North Mine of the Clydesdale Colliery near Sasolburg, Orange Free State, South Africa. The collapse of around 3km² of underground mine area caused the disaster. The underground collapse was caused by the disintegration of around 900 underground pillars supporting the tunnel roofs. Around 1,000 miners were at work underground at the time of collapse. Half of them could survive by escaping via an incline shaft. Few rescue workers also died getting trapped with collapsed ground and methane gas. Wankie Colliery Disaster in Rhodesia (now Zimbabwe) killed 426 people. The disaster occurred on 6 June 1972 at the No. 2 mine shaft of the Wankie Colliery, in north-western Rhodesia. The disaster was caused by multiple explosions in the underground coal mine. The explosion turned into a blast which devastated the main shaft. Four men were killed instantly near the surface. More than 400 mine workers trapped amid rock and deadly methane and carbon monoxide fumes died in the underground. Coal disaster victims included 36 Europeans and 390 Africans. The initial explosion was suspected to have emanated from a dynamite magazine. There were also two new explosions on the next day that filled the underground tunnels with clouds of poisonous gas making the rescue attempts impossible. Oaks Colliery explosion is the second deadliest coal mine disaster in the United Kingdom after the disaster at Senghenydd Colliery. The disaster took place on 12 December 1866 at the Oaks Colliery, near Stairfoot, Barnsley, in South Yorkshire. The death toll of this major nineteenth century coal mine disaster is reported to be 388. It was a firedamp and coal dust explosion suspected to have been ignited by the digging of new workings at the underground mine. The mine was known for containing firedamp since its first disaster in 1847 that killed 73 people. There were two more explosions on 13 December 1866, which killed 27 rescue workers. The Oak Colliery, one of the largest coal mines in England, experienced 17 further explosions until it ceased operations in the 1960s. The Dhanbad coal mine disaster occurred on the night between 27th and 28th May. The disaster was caused by an explosion in Dhori colliery near Dhanbad, the major coal mining town in India. 375 miners were killed in the disaster. It was a firedamp and coal dust explosion. The initial ignition was suspected to have come from the hurricane lantern of a person who entered the underground gallery. The mine’s management alleged it to be an intentional act of ignition. Ten years later on 27 December 1975, another disaster struck the Chasnala colliery, near Dhanbad. The Chasnala mining disaster killed 372 people. The coal dust explosion in the deep mine led to a blast that damaged the roof barrier with a huge water body sitting above it. Most of the deaths were because of the formidable flooding of water into the mine. Monongah Coal Mine Disaster is the largest mining catastrophe in the US. The disaster occurred on 6 December 1907 at two mines of the Monogah mine facility in West Virginia. The number of fatalities in the disaster is recorded as 362. Italian immigrants were the majority of the victims. The disaster was caused by firedamp and coal dust explosion in mines six and seven of the Monogah mine facility operated by Fairmont Coal Company. The explosion devastated the ventilation system, boiler-house, fan and the openings of the mine number eight. Rescue workers could hardly work for 15 minutes due to the lack of breathing equipment. Few of them also succumbed to death because of suffocation. The source of initial ignition for the explosion was attributed to either electric arcs or open lights. The deepest open pit mines are scattered geographically across the world unlike the deepest underground mines, which are mostly concentrated in South Africa. Indonesia is home to the world’s biggest gold mine while South Africa, which houses the majority of the deepest mines in the world, also hosts two of the top 10 largest gold mines.